2,000 sq/ft of waterfront outdoor living space with a private dock. Enjoy a truly unique experience at Lakeside-Loft—one of our Signature Series homes. 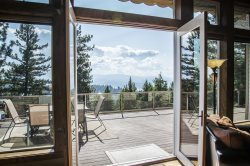 This beautifully constructed high-end cabin sets the perfect tone for a memorable vacation to Lake Coeur d’Alene. Whether you’re enjoying all of the features of the expansive outdoor area or inside marveling at the craftsmanship, you’ll love taking photos and making memories to bring back with you. The heart of the home, the centrally-located kitchen has granite countertops, high quality appliances, and seating for 3 at the bar. Fold down the wooden Murphy style dining table and you’ll have seating for 4 more. Surrounded by stunning lake views, the cozy living room features plenty of comfortable seating, a TV, fireplace, and access to the outdoors. Climb up to the cozy loft and you’ll discover two queen beds and a fun domed ceiling that looks up to the sun, sky and stars. Downstairs a wooden queen sized Murphy bed sleeps 2 more. Your party will enjoy the luxurious bathroom with a stone shower when you’re not swimming in the lake. Outside, the huge deck offers seating for everyone and spares no amenity you’d like for your waterfront vacation. This area boasts an outdoor kitchen with a BBQ, a spacious covered dining area, lush grass down to the waterfront, and a private dock. With only a handful of stairs, this home also makes accessing the water and dock reasonable for most guests. Bring everyone together for a memorable vacation in this one-of-a-kind North Idaho lakefront cabin. Loved everything about the cabin and VRA! They were very friendly and communicative! They gave us great recommendations for renting jet skis and paddle boards! The lakeside loft exceeded our expectations, it was a beautiful cabin with great views and everything we needed like a grill, pizza oven, chairs at each hangout spot, even a paddle boat! We enjoyed playing on water toys, floating the lake, making homemade pizzas, and playing games under the Gazebo when the sun set. It was a great experience that we would all do again! I called the night before and the lady was very helpful and provided property address information immediately. There were no problems. It was great. The process was fairly easy. We loved it. We would happily stay again. Fortunately I had looked up the property on Google Earth, and knew what it looked like from the northern approach. I saw the boathouse as we got close. Everyone was very friendly and helpful. I had to wait a bit for check-in, but once checked in all was smooth sailing from there. The lakeside loft was amazing! We had such a great time enjoying the private dock/swim area. The loft was very cozy and exceeded our expectations! We would stay in this property again in the future without question. It was the most relaxing week! Everything I'd hoped for. Very pleased with kitchen / cooking aides. There were plenty of linens. VRA staff was very helpful and professional. Lakeside Loft : Great location. Beautiful and unique construction. Protected swimming area for the kids. Great service. We'll be staying here again.